Brain Storms, Orphan, Maize for the Gods, and Paranoid. Parkinson’s is personal for award-winning television producer and journalist Jon Palfreman: he was diagnosed with the disease in 2011. In his latest book, Brain Storms, he invites readers along as he seeks to understand the neurodegenerative disorder through the eyes of the researchers working every day to uncover vulnerabilities in the disease’s rapacious progression. “In a profound sense, understanding Parkinson’s disease and finding a cure are now my journalistic beat,” Palfreman writes in the book’s prologue. The author rewinds the clock all the way back to the early 19th century, when the disease was first described by James Parkinson, and brings the story all the way forward to the present day, as scientists and drug developers seek to extinguish the neurodegenerative disorder. And the journey is not a dispassionate one; it is imbued with the sense of urgency that Palfreman feels as Parkinson’s erodes his brain, and as 60,000 new cases are reported in the U.S. every year. Medical geneticist and lawyer Philip Reilly takes on the tough topic of childhood genetic diseases in Orphan, a book about scientific efforts to stamp out the hundreds of individually rare disorders that collectively afflict children and adolescents all over the world. “About 120,000 (3%) [of the babies born in the U.S. every year] will be diagnosed with a genetic disorder that is caused (or heavily influenced) by a mutation in a single gene,” he writes. Some, however, go undiagnosed for decades. Reilly, who has long been involved in the ethics of biotechnology and in nonprofit patient advocacy groups, gives a comprehensive overview of what we’re learning about several such maladies, from the latest research into their genetic bases to new diagnostic tools for early detection and cutting-edge treatments. Although diseases such as alkaptonuria, dystrophic epidermolysis bullosa, and Friedreich’s ataxia are far from household names and are considered “rare” by science, their impact is far-reaching, and, because they usually manifest early in life, the disorders impose a particularly wrenching burden. Corn, humble and unassuming, is one of the most important plants in human history, not to mention biological science. Maize, which is what much of the world calls corn, also serves as grist for a new book by University of British Columbia anthropologist Michael Blake. In Maize for the Gods, Blake traces the history of corn, from modest grassland plant through millennia of agricultural experimentation and migration to modern global staple. 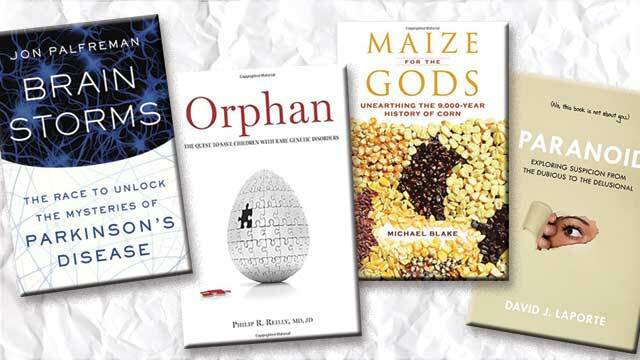 Blake lays out a fine and factual feast, visiting the work of researchers cracking into corn’s biology as well as its impact on human culture. “We see today, all around us, the transformation of both maize and people as it has spread to almost every place on the planet where crops are grown—and even where they aren’t, maize still manages to find a way there,” he writes. Only one important kernel is missing from Blake’s history of maize: it would have been nice to have mentioned the plant’s seminal role in Nobel Prize–winning biologist Barbara McClintock’s pioneering genetics research. Our post-9/11 world is the perfect breeding ground for runaway paranoia. So now, more than ever, it’s important to recognize and treat such overexpressions of what was once an evolutionarily useful emotion. Enter psychologist David LaPorte and his new book, Paranoid, which gives a good overview of paranoia and the real harm it can do when it distorts one’s thinking. The most extreme modern expressions of paranoia come in the form of the mass shootings and bombings by obsessed loners that seem to make headlines ever more frequently. Social change, intrusive technology, and post-9/11 security make people feel increasingly insecure, it seems. “The deadly violence perpetrated by individuals such as Seung-Hui Cho (Virginia Tech), Timothy McVeigh, Jared Loughner, and most recently, Aaron Alexis (Washington Navy Yard) is a chilling testament to the effects of that paranoia,” LaPorte writes.